"Amphibious assault" redirects here. For the band Amphibious Assault, see Fallon Bowman. Two USMC AAVS emerge from the surf at Freshwater Bay, Australia. Amphibious warfare is a type of offensive military operation that today uses naval ships to project ground and air power onto a hostile or potentially hostile shore at a designated landing beach. Through history the operations were conducted using ship's boats as the primary method of delivering troops to shore. Since the Gallipoli Campaign, specialised watercraft were increasingly designed for landing troops, materiel and vehicles, including by landing craft and for insertion of commandos, by fast patrol boats, zodiacs (rigid inflatable boats) and from mini-submersibles. Amphibious warfare includes operations defined by their type, purpose, scale and means of execution. In the British Empire at the time these were called combined operations which were defined as "...operations where naval, military or air forces in any combination are co-operating with each other, working independently under their respective commanders, but with a common strategic object." All armed forces that employ troops with special training and equipment for conducting landings from naval vessels to shore agree to this definition. Since the 20th century an amphibious landing of troops on a beachhead is acknowledged as the most complex of all military maneuvers. The undertaking requires an intricate coordination of numerous military specialties, including air power, naval gunfire, naval transport, logistical planning, specialized equipment, land warfare, tactics, and extensive training in the nuances of this maneuver for all personnel involved. South Korean Type 88 K1 MBT comes ashore from an American LCAC in March 2007. An amphibious operation is similar to but in many ways different from land, naval and air operations. At its basic, such operations include phases of strategic planning and preparation, operational transit to the intended theatre of operations, pre-landing rehearsal and disembarkation, troop landings, beachhead consolidation and conducting inland ground and air operations. Historically, within the scope of these phases a vital part of success was often based on the military logistics, naval gunfire and close air support. Another factor is the variety and quantity of specialised vehicles and equipment used by the landing force that are designed for the specific needs of this type of operation. Amphibious operations can be classified as tactical or operational raids such as the Dieppe Raid, operational landings in support of a larger land strategy such as the Kerch–Eltigen Operation, and a strategic opening of a new Theatre of Operations, for example the Operation Avalanche. The purpose of amphibious operations is always offensive, but limited by the plan and terrain. Landings on islands less than 5,000 km2 (1,900 sq mi) in size are tactical, usually with the limited objectives of neutralising enemy defenders and obtaining a new base of operation. Such an operation may be prepared and planned in days or weeks, and would employ a naval task force to land less than a division of troops. The intent of operational landings is usually to exploit the shore as a vulnerability in the enemy's overall position, forcing redeployment of forces, premature use of reserves, and aiding a larger allied offensive effort elsewhere. Such an operation requiring weeks to months of preparation and planning, would use multiple task forces, or even a naval fleet to land corps-size forces, including on large islands, for example Operation Chromite. A strategic landing operation requires a major commitment of forces to invade a national territory in the archipelagic, such as the Battle of Leyte, or continental, such as Operation Neptune. Such an operation may require multiple naval and air fleets to support the landings, and extensive intelligence gathering and planning of over a year. 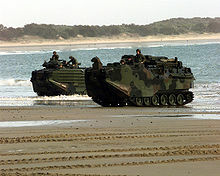 Although most amphibious operations are thought of primarily as beach landings, they can take exploit available shore infrastructure to land troops directly into an urban environment if unopposed. In this case non-specialised ships can offload troops, vehicles and cargo using organic or facility wharf-side equipment. Tactical landings in the past have utilised small boats, small craft, small ships and civilian vessels converted for the mission to deliver troops to the water's edge. Preparation and planning the naval landing operation requires the assembly of vessels with sufficient capacity to lift necessary troops employing combat loading. The military intelligence services produce a briefing on the expected opponent which guides the organisation and equipping of the embarked force. 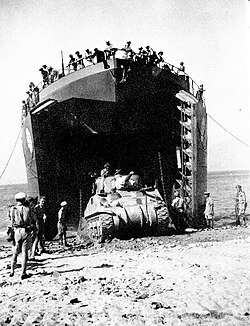 First specially designed landing craft were used for the Gallipoli landings, and armoured tracked vehicles were also available for the Guadalcanal Campaign. Helicopters were first used to support beach landings during Operation Musketeer. Hovercraft have been in use for naval landings by military forces since the 1960s. Recorded amphibious warfare goes back to ancient times. The Sea Peoples menaced the Egyptians from the reign of Akhenaten as captured on the reliefs at Medinet Habu and Karnak. The Hellenic city states routinely resorted to opposed assaults upon each other's shores, which they reflected upon in their plays and other expressions of art. The landing at Marathon by the ancient Persians on 9 September 490 BC, was the largest amphibious until eclipsed by the landings at Battle of Gallipoli. 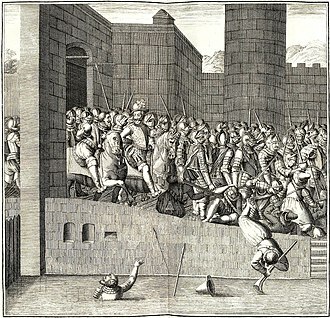 In 1565, the island of Malta was invaded by the Ottoman Turks during the Great Siege of Malta, forcing its defenders to retreat to the fortified cities. A strategic choke point in the Mediterranean Sea, its loss would have been so menacing for the Western European kingdoms that forces were urgently raised in order to relieve the island. But it took four months to train, arm, and move a 5,500-man amphibious force to lift the siege. 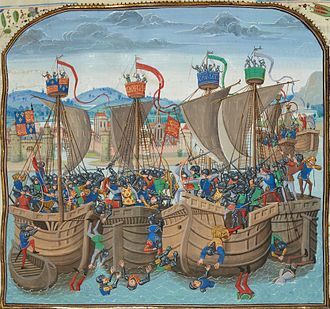 Then, Philip II, King of Spain decided to train and assign amphibious-assault skilled units to the Royal Armada. These units were trained specifically for fighting on and from ships. The Spanish Marines were born. The idea was to set up a permanent assignation of land troops to the Royal Spanish Navy, available for the Crown. Thus other countries adopted the idea and subsequently raised their own, early marine forces as well. The first "professional" marine units were already task-trained amphibious troops, but instead of being disbanded, were kept for the Spanish Crown's needs. Their first actions took place all along the Mediterranean Sea where the Turks and pirate settlements were a risk for commerce and navigation: Algiers, Malta, Gelves. The "Terceras Landing" in the Azores Islands on 25 May 1583, was a military feat as its planners decided to make a fake landing to distract the defending forces (5,000 Portuguese, English and French soldiers); also special seagoing barges were arranged in order to unload cavalry horses and 700 artillery pieces on the beach; special rowing boats were armed with small cannons to support the landing boats; special supplies were readied to be unloaded and support the 11,000-man landing force strength. The total strength of the amphibious force was 15,000 men, including an armada of 90 ships. From the 15th to the 20th centuries, several European countries established and expanded overseas colonies. Amphibious operations mostly aimed to settle colonies and to secure strong points along navigational routes. Amphibious forces were fully organized and devoted to this mission, although the troops not only fought ashore, but on board ships. By their nature amphibious assaults involve highly complex operations, demanding the coordination of disparate elements; therefore disastrous results can ensue from insufficient planning. One of the most spectacular instances of such a failure occurred in 1741 at the Battle of Cartagena de Indias in New Granada, when a large British amphibious assault force with a divided command failed to overcome a much smaller but heavily fortified Spanish defence. Twenty years later, in 1762, a similar British force successfully landed at Havana in Cuba, besieged the city and captured it after a two-month campaign thanks to improved coordination of land and sea forces. A major amphibious landing took place during the Siege of Quebec in 1759, as part of the Seven Years' War. The British produced the first specially designed landing-craft in order to enable their troops to cross the Saint Lawrence River in force. After considering and rejecting a number of plans for landings on the north shore of the river, General James Wolfe and his brigadiers decided in late August to land upriver of the city. The British prepared for their risky deployment upstream. Troops had already been aboard landing ships and drifting up and down the river for several days when on 12 September Wolfe made a final decision on the British landing site, selecting L'Anse-au-Foulon. Wolfe's plan of attack depended on secrecy and surprise — a key element of a successful amphibious operation — a small party of men would land by night on the north shore, climb the tall cliff, seize a small road, and overpower the garrison that protected it, allowing the bulk of his army (5,000 men) to ascend the cliff by the small road and then deploy for battle on the plateau. The operation proved a success, leading to the surrender of the city, and heavily influenced subsequent engagements. In 1762 British Royal Navy sailors and marines succeed in taking the capitals of the Spanish West and East Indies: Havana in Cuba and Manila in the Philippines respectively. In 1776 Samuel Nicholas and the Continental Marines, the "progenitor" of the United States Marine Corps, made a first successful landing in the Battle of Nassau in the Bahamas. In 1782 The British rebuffed a long Franco-Spanish attempt to seize Gibraltar by water-borne forces. In 1783 a Franco-Spanish force invaded the British-held island of Minorca. In 1798 Minorca experienced yet another of its many changes of sovereignty when captured by a British landing. During the Crimean War of 1853-1856 the anti-Russian alliance launched an Anglo-French amphibious operation against Russia at Bomarsund, Finland on 8 August 1854. During the American Civil War of 1861-1865 the United States made several amphibious assaults along the coastlines of the Confederate States. Actions at Hatteras Inlet (August 1861) and at Port Royal, South Carolina were the first of many attacks, others occurring on Roanoke Island, NC; Galveston, TX; Fort Sumter, Morris Island and James Island, SC; and several more. The largest such clash happened in January 1865 at Fort Fisher - the largest and most powerful fort in the world at the time - which protected the entrance of Wilmington, North Carolina. The assaulting force consisted of over 15,000 men and 70 warships with over 600 guns. Amphibious warfare during the War of the Pacific of 1879 to 1883 saw coordination of army, navy and specialized units. The first amphibious assault of this war took place during the Battle of Pisagua when 2,100 Chilean troops successfully took Pisagua from 1,200 Peruvian and Bolivian defenders on 2 November 1879. Chilean Navy ships bombarded beach defenses for several hours at dawn, followed by open, oared boats landing army infantry and sapper units into waist-deep water, under enemy fire. An outnumbered first landing-wave fought at the beach; the second and third waves in the following hours succeeded in overcoming resistance and moving inland. By the end of the day, an expeditionary army of 10,000 had disembarked at the captured port. In 1881 Chilean ships transported approximately 30,000 men, along with their mounts and equipment, 500 miles (800 km) in order to attack Lima. Chilean commanders commissioned purpose-built, flat-bottomed landing craft that would deliver troops in shallow water closer to the beach, possibly[original research?] 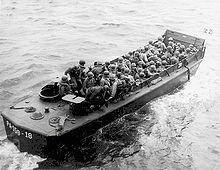 the first purpose-built amphibious landing-craft in history: "These [36 shallow draft, flat-bottomed] boats would be able to land three thousand men and twelve guns in a single wave". Neutral military observers closely studied landing tactics and operations during the War of the Pacific: two Royal Navy ships monitored the Battle of Pisagua; United States Navy observer Lt. Theodorus B. M. Mason included an account in his report The War on the Pacific Coast of South America. The USS Wachusett with Alfred Thayer Mahan in command, was stationed at Callao, Peru, protecting American interests during the final stages of the War of the Pacific. He formulated his concept of sea power while reading a history book in an English gentleman's club in Lima, Peru. This concept became the foundation for his celebrated The Influence of Sea Power upon History (1890). An amphibious assault took place on the beaches of Veracruz, Mexico in 1914, when the United States Navy attacked and occupied the city as result of the Tampico Affair. World War I marked the beginning of the first modern amphibious warfare operations. However, tactics and equipment were still rudimentary and required much improvisation. At the time, British Royal Marine Light Infantry (merged with the Royal Marine Artillery in the 1920s to form the Royal Marines) were used primarily as naval parties onboard Royal Navy warships to maintain discipline and man ships' guns. The RMLI joined a new Royal Navy division, the Royal Naval Division, formed in 1914 (out of those not needed on ships) to fight on land; however, throughout the conflict, army units were depended upon to provide the bulk, if not all, of troops used in amphibious landings. The first amphibious assault of the war ended in disaster in 1914. A large British Indian Army force was directed to launch an amphibious assault on Tanga, German East Africa. 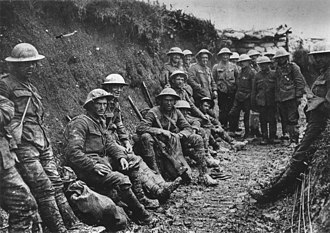 British actions prior to the assault, however, alerted the Germans to prepare to repel an invasion. The Indian forces suffered heavy casualties when they advanced on the city, forcing them to withdraw back to their boats, leaving much of their equipment behind. The Russian army and navy also grew adept to amphibious warfare in the Black Sea, conducting many raids and bombardments on Ottoman positions. On the 11 October 1917, German land and naval forces launched an amphibious assault, code named Operation Albion, on the islands of Saaremaa (Ösel), Hiiumaa (Dagö) and Muhu (Moon); they controlled the entrance to the Gulf of Riga. By the end of the month German forces had successfully overrun the islands forcing the Russians to abandon them with the loss of some 20,000 troops, 100 guns and the pre-dreadnought battleship Slava. The capture of the islands opened a route for German naval forces into the Gulf of Finland threatening the city of Petrograd, a fact that contributed to the cessation of hostilities on the Eastern front. The first large scale amphibious operations, ones that were to heavily influence theorists in the decades to come, were conducted as part of the Battle of Gallipoli in 1915 against the Ottoman Empire during World War I. The Gallipoli peninsula forms the northern bank of the Dardanelles, a strait that provided a sea route to what was then the Russian Empire, one of the Allied powers during the war. Intending to secure it, Russia's allies Britain and France launched a naval attack followed by an amphibious landing on the peninsula with the eventual aim of capturing the Ottoman capital of Constantinople (modern-day Istanbul). Although the naval attack was repelled and the land campaign failed, the campaign was the first modern amphibious landing, and featured air support, specialized landing craft and a naval bombardment. The seaplane tender HMS Ark Royal supported the landings under the command of Commander Robert Clark-Hall. Seaplanes were used for aerial reconnaissance, ground support for the troops landing at Anzac Cove and the bombing of fortifications. Ark Royal was augmented by a squadron from the No. 3 Squadron of the Royal Naval Air Service, operating from a nearby island. Initial landings took place in unmodified rowing boats that were extremely vulnerable to attack from the shore defences. The first purpose built landing craft were built for the campaign. SS River Clyde, built as a collier, was adapted to be a landing ship for the Landing at Cape Helles. Openings were cut in her steel hull as sally ports from which troops would emerge onto gangways and then to a bridge of smaller boats from the ship to the beach. Boiler plate and sandbags were mounted on her bow, and behind them a battery of 11 machine guns was installed. 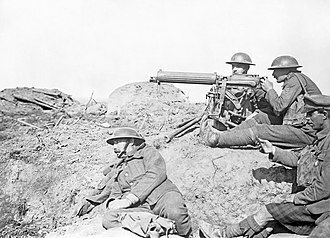 The machine gun battery was manned by Royal Naval Air Service men. Work began on painting River Clyde's hull sandy yellow as camouflage, but this was incomplete by the time of the landing. It was soon clear that the Turkish defence equipped with rapid-fire weapons, meant that ordinary landing boats were inadequate for the task. In February 1915, orders were placed for the design of purpose built landing craft. A design was created in four days resulting in an order for 200 'X' Lighters with a spoon-shaped bow to take shelving beaches and a drop down frontal ramp. The first use took place after they had been towed to the Aegean and performed successfully in the 6 August landing at Suvla Bay of IX Corps, commanded by Commander Edward Unwin. 'X' Lighters, known to the soldiers as 'Beetles', carried about 500 men, displaced 135 tons and were based on London barges being 105 feet, 6 inches long, 21 feet wide, and 7 feet, 6 inches deep. The engines mainly ran on heavy oil and ran at a speed of approximately 5 knots. The sides of the ships were bullet proof, and was designed with a ramp on the bow for disembarkation. 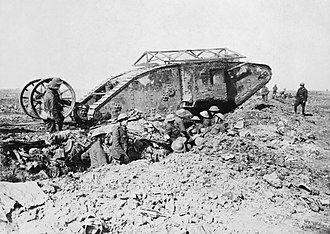 A plan was devised to land British heavy tanks from pontoons in support of the Third Battle of Ypres, but this was abandoned. The lessons of the Gallipoli campaign had a significant impact upon the development of amphibious operational planning, and have since been studied by military planners prior to operations such as the Normandy Landings in 1944 and during the Falklands War in 1982. The campaign also influenced US Marine Corps amphibious operations during the Pacific War, and continues to influence US amphibious doctrine. During the interwar period the campaign "became a focal point for the study of amphibious warfare" in the United Kingdom and United States, because it involved the four types of amphibious operations: the raid, demonstration, assault and withdrawal. Analysis of the campaign before World War II led to a belief among many armed forces that amphibious assaults could not succeed against modern defences. The perception continued until the Normandy Landings in June 1944, despite some successful examples of amphibious operations earlier in the war, such as those in Italy, and at Tarawa and in the Gilbert Islands in the Pacific. Although the negative perception prevailed among Allied planners in the interwar years, the war situation after 1940 meant that such operations had to be considered. However, despite early successes in North Africa and Italy, it was not until Normandy that the belief that opposed landings could not succeed was completely excised. The Alhucemas landing on 8 September 1925, performed by a Spanish-French coalition against rebel Berber tribesmen in the north of Morocco, was a landing where tanks were used for the first time and naval gunfire support was employed by the landing forces, directed by spotting personnel with communication devices. Floating depots were organized with medical, water, ammunition and food supplies, to be dispatched ashore when needed. The barges used in this landing were the surviving "K" boats from Gallipoli. In 1938, Japanese forces attacked Chinese defenders over the Yangtze River at the Battle of Wuhan. Soon, the Japanese would later further improve its techniques upon seaborne assaults by the Second Sino-Japanese War. By World War II, marines such as the Special Naval Landing Force, used amphibious landings to attack and sweep across territories in South East Asia. Their technique of surprise landings in continuous success and the support from the Navy, inspired the British and American landings in World War II such as D-Day and the Pacific Campaign. The Landing Craft Mechanized was designed by Inter-Service Training and Development Centre from 1938 as the first specialized amphibious ship for the transportation of tanks. The costly failure of the Gallipoli campaign coupled with the emerging potential of airpower satisfied many in naval and military circles that the age of amphibious operations had come to a close. Still, throughout the 1920s and 1930s, animated discussion in Staff Colleges in Britain and the Indian Army Staff College at Quetta surrounded the strategic potential of the Dardanelles campaign compared with the strategic stalemate of the Western Front. The economic austerity of the worldwide economic depression and the government's adoption of the Ten Year Rule assured that such theoretical talk would not result in the procurement of any large scale equipment. Despite this outlook, the British produced the Motor Landing Craft in 1920, based on their experience with the early 'Beetle' armoured transport. The craft could put a medium tank directly onto a beach. From 1924, it was used with landing boats in annual exercises in amphibious landings. It was later called Landing Craft, Mechanized (LCM) and was the predecessor of all Allied landing craft mechanised (LCM). The Army and Royal Navy formed a landing craft committee to "recommend... the design of landing craft". A prototype motor landing craft, designed by J. Samuel White of Cowes, was built and first sailed in 1926. It weighed 16 tons and had a box-like appearance, having a square bow and stern. To prevent fouling of the propellers in a craft destined to spend time in surf and possibly be beached, a crude waterjet propulsion system was devised by White's designers. A Hotchkiss petrol engine drove a centrifugal pump which produced a jet of water, pushing the craft ahead or astern, and steering it, according to how the jet was directed. Speed was 5-6 knots and its beaching capacity was good. By 1930, three MLC were operated by the Royal Navy. The Inter-Service Training and Development Centre, which helped to pioneer modern amphibious warfare doctrine, came under the command of Combined Operations Headquarters in June 1940. Pictured, the badge of Combined Operations. For a short journey, from shore to shore, the cargo could be rolled or carried into the boat over its ramp. On longer journeys, ship to shore, a derrick would lower the MLC into the sea from the transporting vessel. The derrick would then lower the vehicle or cargo load. 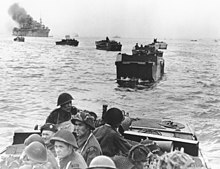 Upon touching down on shore, soldiers or vehicles exited by the bow ramp. Although there was much official apathy toward amphibious operations, this began to change in the late 1930s. The Royal Naval Staff College at Greenwich, drafted a document detailing combined operations requirements and submitted it to the Chiefs of Staff in 1936. The document recommended the establishment of an inter-service 'Training and Development Centre', with a permanent force of Royal Marines attached to it. Its functions were to "train in all methods for the seizure of defended beaches; develop the materiel necessary for such methods, with special regard to protection of troops, speed of landing, and the attainment of surprise; and develop methods and materiel for the destruction or neutralization of enemy defenses, including bombardment and aircraft co-operation. The Inter-Service Training and Development Centre was established at Fort Cumberland, near Portsmouth in 1938, and brought together representatives from the Royal Navy, Army, and Royal Air Force convened with the portfolio of developing methods and equipment to use in Combined Operations. 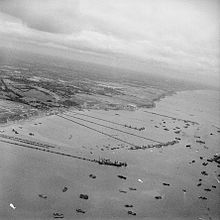 The Centre examined certain specific problems, including craft for landing tanks, beach organisation, floating piers, headquarters ships, amphibian tanks, underwater obstacles, the landing of water and petrol and the use of small craft in amphibious raids By the end of 1939 the ISTDC had codified a policy for landings, and defended it at Staff College discussions. Operational experience during the Second World War introduced modifications to this landing policy, but it was essentially the policy used in the Torch and Husky landings four years later. The system provided for an approach under cover of darkness in fast ships carrying special craft; the craft being sent ashore while the ships lay out of sight of land; small-craft smoke and gun protection while the beachhead was seized; the landing of a reserve; the capture of a covering position far enough inland to secure the beach and anchorage from enemy fire; the bringing in of ships carrying the main body; and finally the discharge of vehicles and stores by other craft specially designed to do so directly on to beaches. And in all this it was important to achieve tactical surprise. Among the many tactical innovations introduced by the Centre, codified in the Manual on Combined Operations and the Standard Naval Bombardment Code, was the use of Floating Piers (pontoons) to bridge the water gap, the creation of Smoke Generating devices to obscure the assault and the use of infra-red directional beacons for landing accuracy. The Centre also played a role in the development of the first specialized landing crafts, including the Assault Landing Craft, the Mechanized Landing Craft (LCM(1)), the Landing Craft Tank (Mk. 1), Support Landing Craft LCS(1), LCS(2) and Landing Ship Infantry. Divisional-sized amphibious landing exercises were carried out by the British Army in the 1930s. Major Earl Hancock Ellis developed amphibious warfare doctrine for the United States Marine Corps in the interwar period, and successfully predicted the nature of the subsequent Pacific campaign. In contrast to the British attitude, the U.S. military, especially the Marine Corps remained enthusiastic at the possibilities of amphibious warfare. The Marines Corps was searching for an expanded mission after World War I, during which it had merely been used as a junior version of the Army infantry. During the 1920s, it found a new mission — to be a fast-reacting, light infantry fighting force carried rapidly to far off locations by the US Navy. Its special role would be amphibious landings on enemy-held islands, but it took years to figure out how to do that. The Mahanian notion of a decisive fleet battle required forward bases for the Navy close to the enemy. After the Spanish–American War the Marines gained the mission of occupying and defending those forward bases, and began a training program on Culebra Island, Puerto Rico. As early as 1900 the General Board of the United States Navy considered building advance bases for naval operations in the Pacific and the Caribbean. The Marine Corps was given this mission in 1920, but the challenge was to avoid another disaster like Gallipoli. The conceptual breakthrough came in 1921 when Major "Pete" Ellis wrote Advanced Base Operations in Micronesia a secret 30,000-word manifesto that proved inspirational to Marine strategists and highly prophetic. To win a war in the Pacific, the Navy would have to fight its way through thousands of miles of ocean controlled by the Japanese—including the Marshall, Caroline, Marianas and Ryukyu island chains. If the Navy could land Marines to seize selected islands, they could become forward bases. LCVPs, known as 'Higgins Boats', were the first specialized landing craft for the US Navy. Pictured, USS Darke (APA-159)'s LCVP 18, possibly with Army troops as reinforcements at Okinawa, 1945. Ellis argued that with an enemy prepared to defend the beaches, success depended on high-speed movement of waves of assault craft, covered by heavy naval gunfire and attack from the air. He predicted that the decisive action would take place on the beach itself, so the assault teams would need not just infantry but also machine gun units, light artillery, light tanks, and combat engineers to defeat beach obstacles and defenses. Assuming the enemy had its own artillery, the landing craft would have to be specially built to protect the landing force. The failure at Gallipoli came because the Turks could easily reinforce the specific landing sites. The Japanese would be unable to land new forces on the islands under attack. Not knowing which of the many islands would be the American target, the Japanese would have to disperse their strength by garrisoning many islands that would never be attacked. An island like Eniwetok in the Marshall Islands, would, Ellis estimated, require two regiments, or 4,000 Marines. Guided by Marine observer aircraft, and supplemented by Marine light bombers, warships would provide enough firepower so that Marines would not need any heavy artillery (in contrast to the Army, which relied heavily on its artillery). Shelling defended islands was a new mission for warships. The Ellis model was officially endorsed in 1927 by the Joint Board of the Army and Navy (a forerunner of the Joint Chiefs of Staff). 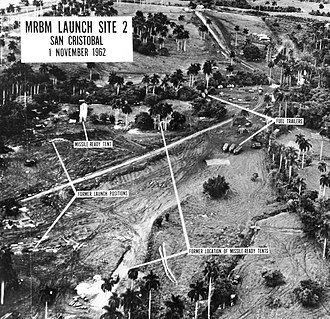 However, actual implementation of the new mission took another decade because the Marine Corps was preoccupied in Central America and the Navy was slow to start training in how to support the landings. The prototype advanced base force officially evolved into the Fleet Marine Force (FMF) in 1933. In 1939, during the annual Fleet Landing Exercises, the FMF became interested in the military potential of Andrew Higgins's design of a powered, shallow-draught boat. These LCVPs, dubbed the 'Higgins Boats', were reviewed and passed by the U.S. Naval Bureau of Construction and Repair. Soon, the Higgins boats were developed to a final design with a ramp, and were produced in large numbers. By the Second World War tactics and equipment had moved on. The first use of British landing craft in an opposed landing in the Second World War, saw the disembarkation of French Foreign Legionnaires of the 13th Demi-Brigade and supporting French Hotchkiss H39 tanks on the beach at Bjerkvik, eight miles (13 km) above Narvik, on 13 May during the Norwegian campaign. The first major and successful amphibious operation was Operation Ironclad, a British campaign to capture Vichy French-controlled Madagascar. The naval contingent consisted of over 50 vessels, drawn from Force H, the British Home Fleet and the British Eastern Fleet, commanded by Rear Admiral Edward Neville Syfret. The fleet included the aircraft carrier Illustrious, her sister ship Indomitable and the aging battleship Ramillies to cover the landings. The first wave of the British 29th Infantry Brigade and No. 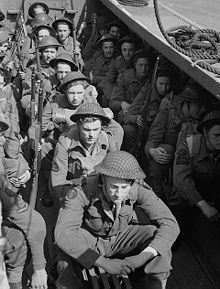 5 Commando landed in assault craft on 5 May 1942, follow-up waves were by two brigades of the 5th Infantry Division and Royal Marines. Air cover was provided mainly by Fairey Albacore and Fairey Swordfish torpedo bombers which attacked Vichy shipping. Purpose built landing craft were among the vessels used at the evacuation from Dunkirk (Operation Dynamo) and an amphibious operation was tried out at Dieppe in 1942. The operation proved a costly failure, but the lessons, hard learned, were used later. Many small-scale operations were conducted by the Allies on the Axis-held coast of Europe, including raids on the Lofoten Islands, St Nazaire and Bruneval. In the run up to World War II, many specialized landing craft, both for infantry and vehicles, were developed. In November 1938, the Inter-Service Training and Development Centre proposed a new type of landing craft. Its specifications were to weigh less than ten long tons, to be able to carry the thirty-one men of a British Army platoon and five assault engineers or signallers, and to be so shallow drafted as to be able to land them, wet only up to their knees, in eighteen inches of water. All of these specifications made the Landing Craft Assault; a separate set of requirements were laid down for a vehicle and supplies carrier, although previously the two roles had been combined in the Motor Landing Craft. J. S. White of Cowes built a prototype to the Fleming design. Eight weeks later the craft was doing trials on the Clyde. All landing craft designs must find a compromise between two divergent priorities; the qualities that make a good sea boat are opposite those that make a craft suitable for beaching. The craft had a hull built of double-diagonal mahogany planking. The sides were plated with "10lb. DIHT" armour, a heat treated steel based on D1 steel, in this case Hadfield’s Resista ¼”. The first LCI(L)s entered service in 1943 chiefly with the Royal Navy (RN) and United States Navy. Some 923 LCI were built in ten American shipyards and 211 provided under lend-lease to the Royal Navy. Two examples of the LCM 1 on an exercise prior to the 1942 Dieppe Raid. On the right is an earlier model without the later fully armoured steering shelter. This craft also has been given additional armour around the tank well and a ramp extension. Following the Inter-Service Training and Development Centre’s (ISTDC) successful development of the infantry carrying LCA, attention turned to the means of efficiently delivering a tank to a beach in 1938. Inquires were made of the army as to the heaviest tank that might be employed in a landing operation. The army wanted to be able to land a 12-ton tank, but the ISTDC, anticipating weight increases in future tank models specified 16 tons burthen for Mechanised Landing Craft designs. Another governor on any design was the need to land tanks and other vehicles in less than approximately 2 ½ feet of water. Design work began at John I. Thornycroft Ltd. in May 1938 with trials completing in February 1940. Although early LCM(1)s were powered by two Thornycroft 60 bhp petrol engines, the majority were powered by Chrysler, in-line, 6-cylinder Crown petrol engines. Constructed of steel and selectively clad with armour plate, this shallow-draft, barge-like boat with a crew of 6, could ferry a tank of 16 long tons to shore at 7 knots (13 km/h). Depending on the weight of the tank to be transported the craft might be lowered into the water by its davits already loaded or could have the tank placed in it after being lowered into the water. A Crusader I tank emerges from the Tank Landing Craft TLC-124, 26 April 1942. The first LCT Mark 1 was launched by Hawthorn Leslie in November 1940. It was an all-welded 372-ton steel-hulled vessel that drew only 3 feet (0.91 m) of water at the bow. Sea trials soon proved the Mark 1 to be difficult to handle and almost unmanageable in some sea conditions. The designers set about correcting the faults of the Mark 1 in the LCT Mark 2. Longer and wider, three Paxman diesel or Napier Lion petrol engines replaced the Hall-Scotts, and 15 and 20 lb. armoured shielding was added to the wheelhouse and gun tubs. The Mark 3 had an additional 32-foot (9.8 m) midsection that gave it a length of 192 feet (59 m) and a displacement of 640 tons. Even with this extra weight, the vessel was slightly faster than the Mark 1. The Mk.3 was accepted on 8 April 1941, and was prefabricated in five sections. The Mark 4 was slightly shorter and lighter than the Mk.3, but had a much wider beam (38 ft 9 in (11.81 m)) and was intended for cross channel operations as opposed to seagoing use. When tested in early assault operations, like the ill-fated Canadian commando raid on Dieppe in 1942, the lack of manoeuvring ability led to the preference for a shorter overall length in future variants, most of which were built in the United States. When the United States entered the war in December 1941, the U.S. Navy had no amphibious vessels at all, and found itself obliged to consider British designs already in existence. 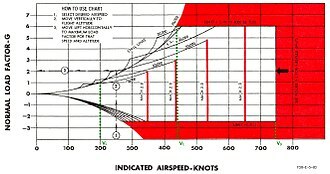 One of these, advanced by K.C. Barnaby of Thornycroft, was for a double-ended LCT to work with landing ships. The Bureau of Ships quickly set about drawing up plans for landing craft based on Barnaby's suggestions, although with only one ramp. The result, in early 1942, was the LCT Mark 5, a 117-foot craft with a beam of 32 feet that could accommodate five 30-ton or four 40-ton tanks or 150 tons of cargo. With a crew of twelve men and one officer, this 286 ton landing craft had the merit of being able to be shipped to combat areas in three separate water-tight sections aboard a cargo ship or carried pre-assembled on the flat deck of an LST. The Mk.5 would be launched by heeling the LST on its beam to let the craft slide off its chocks into the sea, or cargo ships could lower each of the three sections into the sea where they were joined together. In three separate acts dated 6 February 1942, 26 May 1943, and 17 December 1943, Congress provided the authority for the construction of LSTs along with a host of other auxiliaries, destroyer escorts, and assorted landing craft. The enormous building program quickly gathered momentum. Such a high priority was assigned to the construction of LSTs that the previously laid keel of an aircraft carrier was hastily removed to make room for several LSTs to be built in her place. The keel of the first LST was laid down on 10 June 1942 at Newport News, Va., and the first standardized LSTs were floated out of their building dock in October. Twenty-three were in commission by the end of 1942. Lightly armored, they could steam cross the ocean with a full load on their own power, carrying infantry, tanks and supplies directly onto the beaches. Together with 2,000 other landing craft, the LSTs gave the troops a protected, quick way to make combat landings, beginning in summer 1943. 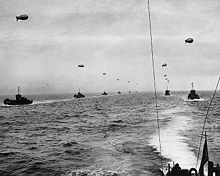 Large landing craft convoy crosses the English Channel on 6 June 1944. The most famous amphibious assault of the war, and of all time, was the Normandy Landings on 6 June 1944, in which British, Canadian, and US forces were landed at Utah, Omaha, Gold, Juno and Sword beaches in the largest amphibious operation in history. The organizational planning of the landing itself (Operation Neptune) was in the hands of Admiral Bertram Ramsay. It covered the landing of the troops and their re-supply. Many innovative elements were included in the operation to ensure its success. Operation Pluto was a scheme developed by Arthur Hartley, chief engineer with the Anglo-Iranian Oil Company, to construct an undersea oil pipeline under the English Channel between England and France to provide logistical support to the landed armies. Allied forces on the European continent required a tremendous amount of fuel. Pipelines were considered necessary to relieve dependence on oil tankers, which could be slowed by bad weather, were susceptible to German submarines, and were also needed in the Pacific War. Geoffrey William Lloyd, the Minister for Petroleum gained the support of Admiral Mountbatten, Chief of Combined Operations for the operation. Two types of pipeline were developed. The first type was the flexible HAIS pipe with a 3 inch (75 mm) diameter lead core, weighing around 55 long tons per nautical mile (30 t/km), was essentially a development by Siemens Brothers (in conjunction with the National Physical Laboratory) of their existing undersea telegraph cables, and known as HAIS (from Hartley-Anglo-Iranian-Siemens). The second type was a less flexible steel pipe of similar diameter, developed by engineers from the Iraq Petroleum Company and the Burmah Oil Company. In June 1942 the Post Office cable ship Iris laid lengths of both Siemens’ and Henleys’ cable in the Clyde. The pipeline was completely successful and PLUTO was formally brought into the plans for the invasion of Europe. The project was deemed "strategically important, tactically adventurous, and, from the industrial point of view, strenuous". After full-scale testing of an 83 km (45 nautical mile) HAIS pipe across the Bristol Channel between Swansea in Wales and Watermouth in North Devon, the first line to France was laid on 12 August 1944, over the 130 km (70 nautical miles) from Shanklin Chine on the Isle of Wight across the English Channel to Cherbourg. A further HAIS pipe and two HAMELs followed. As the fighting moved closer to Germany, 17 other lines (11 HAIS and 6 HAMEL) were laid from Dungeness to Ambleteuse in the Pas-de-Calais. Portable harbours were also prefabricated as temporary facilities to allow rapid offloading of cargo onto the beaches during the Allied invasion of Normandy. The Dieppe Raid of 1942 had shown that the Allies could not rely on being able to penetrate the Atlantic Wall to capture a port on the north French coast. The problem was that large ocean-going ships of the type needed to transport heavy and bulky cargoes and stores needed sufficient depth of water under their keels, together with dockside cranes, to off-load their cargo and this was not available except at the already heavily defended French harbours. Thus, the Mulberries were created to provide the port facilities necessary to offload the thousands of men and vehicles, and tons of supplies necessary to sustain Operation Overlord and the Battle of Normandy. The harbours were made up of all the elements one would expect of any harbour: breakwater, piers, roadways etc. At a meeting following the Dieppe Raid, Vice-Admiral John Hughes-Hallett declared that if a port could not be captured, then one should be taken across the Channel. The concept of Mulberry harbours began to take shape when Hughes-Hallett moved to be Naval Chief of Staff to the Overlord planners. The proposed harbours called for many huge caissons of various sorts to build breakwaters and piers and connecting structures to provide the roadways. The caissons were built at a number of locations, mainly existing ship building facilities or large beaches like Conwy Morfa around the British coast. The works were let out to commercial construction firms including Balfour Beatty, Costain, Nuttall, Henry Boot, Sir Robert McAlpine and Peter Lind & Company, who all still operate today, and Cubitts, Holloway Brothers, Mowlem and Taylor Woodrow, who all have since been absorbed into other businesses that are still operating. On completion they were towed across the English Channel by tugs to the Normandy coast at only 4.3 Knots (8 km/h or 5 mph), built, operated and maintained by the Corps of Royal Engineers, under the guidance of Reginald D. Gwyther, who was appointed CBE for his efforts. By 9 June, just 3 days after D-Day, two harbours codenamed Mulberry "A" and "B" were constructed at Omaha Beach and Arromanches, respectively. However, a large storm on 19 June destroyed the American harbour at Omaha, leaving only the British harbour still intact but damaged, which included damage to the 'Swiss Roll' which had been deployed as the most western floating roadway had to be taken out of service. The surviving Mulberry "B" came to be known as Port Winston at Arromanches. While the harbour at Omaha was destroyed sooner than expected, Port Winston saw heavy use for 8 months—despite being designed to last only 3 months. In the 10 months after D-Day, it was used to land over 2.5 million men, 500,000 vehicles, and 4 million tonnes of supplies providing much needed reinforcements in France. Salerno Operation Avalanche 9 September 1943 Also involved two supporting operations: in Calabria (Operation Baytown, 3rd Sept) and Taranto (Operation Slapstick, 9 September). Iwo Jima Battle of Iwo Jima 19 February 1945 As part of the American invasion of the island of Iwo Jima, designated Operation Detachment, during the Battle of Iwo Jima the U.S. Marines landed on and eventually captured the island of Iwo Jima. 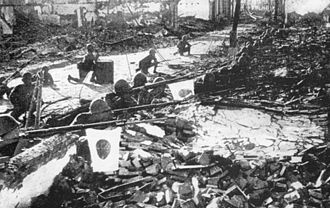 Okinawa Battle of Okinawa 1 April 1945 The series of battles fought in the Ryukyu Islands, centered on the island of Okinawa, included the largest amphibious assault in the Pacific War during World War II, the 1 April 1945 invasion of the island of Okinawa itself. Landing craft approach Blue Beach during the Inchon landings on 15 September 1950, covered by the U.S. Navy destroyer USS De Haven (DD-727) (bottom center). During the Korean War the U.S. X Corps, consisting of the 1st Marine Division and 7th Infantry Division landed at Inchon. Conceived of and commanded by U.S. General Douglas MacArthur, this landing is considered by many military historians to have been a tactical jewel, one of the most brilliant amphibious maneuvers in history (See analysis in main article). The success of this battle eventually resulted in link up with U.S. Army forces that broke out of the Pusan perimeter, and led by the 1st Cavalry Division and its Task Force Lynch, cleared much of South Korea. A second landing by the Tenth Corps on the east coast approached the Chosin Reservoir and hydroelectric plants that powered much of Communist China's heavy industry, and led to intervention by Chinese forces on behalf of North Korea. Amphibious landings also took place during the First Indochina War, notably during Operation Camargue, one of the largest of the conflict. 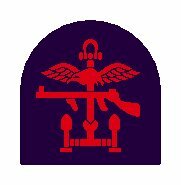 The British Royal Marines made their first post-World War II amphibious assault during the Suez Crisis of 1956 when they successfully landed at Suez on 6 November as part of a joint seaborne/airborne operation code-named MUSKETEER. The first use of helicopters in an amphibious assault came during the Anglo-French-Israeli invasion of Egypt in 1956 (the Suez War). Two British light fleet carriers were pressed into service to carry helicopters, and a battalion-sized airborne assault was made. Two of the other carriers involved, HMS Bulwark (R08) and Albion (R07), were converted in the late 1950s into dedicated "commando carriers." Nearly 30 years later in the Falklands War, the 1st Marines Brigade of the Argentine Marine Corps along with Navy's Special Forces performed Operation Rosario landing at Mullet Creek near Stanley on 2 April 1982, while later the Royal Marines' 3 Commando Brigade, (augmented by the British Army's Parachute Regiment) landed at Port San Carlos on 21 May 1982 during Operation Sutton. The Turkish Armed Forces launched an amphibious assault on 20 July 1974, on Kyrenia, following the 1974 Cypriot coup d'état. The Turkish naval force provided naval gunfire support during the landing operation and transported the amphibious forces from the port of Mersin to the island. The Turkish landing forces consisted of around 3,000 troops, tanks, armoured personnel carriers and artillery pieces. During the Persian Gulf War, Assault Craft Unit 5 was able to position U.S. Marine and naval support off the coast of Kuwait and Saudi Arabia. This force was composed of 40 amphibious assault ships, the largest such force to be assembled since the Battle of Inchon. The objective was to fix the six Iraqi divisions deployed along the Kuwaiti coast. The purpose behind this amphibious maneuver (known as an amphibious demonstration) was to prevent 6 Iraqi divisions poised for the defense of the littorals from being able to actively engage in combat at the real front. The operation was extremely successful in keeping more than 41,000 Iraqi forces from repositioning to the main battlefield. 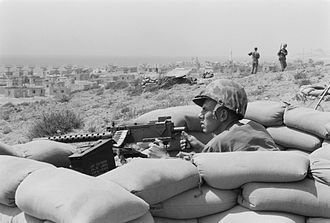 As a result, the Marines maneuvered through the Iraq defense of southern Kuwait and outflanked the Iraqi coastal defense forces. In late 2001, USS Peleliu (LHA-5) amphibious group sent ashore 15th MEU into Northern Pakistan and Afghanistan. 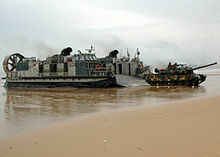 An amphibious assault was carried out by Royal Marines, U.S. Marines and units of the Polish special forces when they landed at the Al-Faw Peninsula on 20 March 2003 during the Iraq War. On March 25, 2008, Operation Democracy in Comoros was launched in the Comoros by government and African Union troops. The amphibious assault led to the ousting of Colonel Bacar's government, which had taken over the autonomous state of Adjouan. From September 28 to October 1, 2012, the Somali National Army led an assault in conjuncture with allied militia and Kenyan troops to liberate the city of Kismayo from insurgent control. The operation, known as Operation Sledge Hammer, started with the landing of Somali and Kenyan troops outside the city of Kismayo. By October 1, the coalition forces were able to push Al-Shabaab out of the city. ^ Turk, Richard W. (1987). The Ambiguous Relationship: Theodore Roosevelt and Alfred Thayer Mahan. Contributions in military studies, ISSN 0883-6884. 63. Greenwood Press. p. 11. ISBN 9780313256448. Retrieved 2016-08-08. What was at hand, in the library of the English Club in Lima, was Theodore Mommsen's History of Rome. Mahan began to envision the sea as both a commercial highway and an avenue for one power to launch an attack upon another. He next began to consider sources of 'maritime power or weakness': material, personnel, national aptitude, harbors, coastlines, control of commercial routes. ^ Halpern, Paul G. (11 October 2012). A Naval History of World War I. Naval Institute Press. ISBN 9781612511726. ^ "1914–1926". Royal Mail Steam Packet Company. Merchant Navy Officers. Retrieved 10 April 2013. ^ a b Wahlert, Glenn (2008). Exploring Gallipoli: An Australian Army Battlefield Guide. Australian Army Campaign Series. 4. Canberra: Army History Unit. p. 29. ISBN 978-0-9804753-5-7. ^ Holmes, Richard, ed. (2001). The Oxford Companion to Military History. Oxford: Oxford University Press. p. 343. ISBN 0-19-866209-2. ^ Gatchel, Theodore L. (1996). At the Water's Edge: Defending Against the Modern Amphibious Assault. Naval Institute Press. p. 10. ISBN 978-1-55750-308-4. ^ "Japanese Special Naval Landing Forces". www.dutcheastindies.webs.com. ^ Houterman, J.N. "Royal Navy (RN) Officers 1939-1945 -- M". Retrieved 2 February 2017. ^ John J. Reber, "Pete Ellis: Amphibious Warfare Prophet," U.S. Naval Institute Proceedings (1977) 103#11 pp 53-64. ^ Allan R. Millett, "Semper Fidelis: The History of the United States Marine Corps", (New York City, NY: The Free Press, 1991). ^ "British vessels lost at sea in World War 2 - landing ships and craft, LSI, LST, LCT, LCG, LCV, LCVP etc". Retrieved 2 February 2017. ^ "Pipeline Under The Ocean". Combined Operations. Retrieved 20 February 2012. ^ "BBC NEWS - In pictures: Pluto". Retrieved 2 February 2017. ^ "Mulberry Harbours". Retrieved 2 February 2017. ^ Thames Tugs. Mulberry Harbour: British, French and Dutch tugs. Retrieved on 20 April 2009. ^ "Battle Of Okinawa: Summary, Fact, Pictures and Casualties ('largest amphibious landing in the Pacific theater of World War II')". Historynet.com. Retrieved 15 January 2016. ^ Fall, Bernard, Street Without Joy, 1961. p. 144. ^ Pike, John. "Turkey's Invasion of Greek Cyprus". Retrieved 2 February 2017. ^ Hayden, Thomas. (1995). "Amphibious Operations in the Gulf War: 1990–91". Marine Corps Gazette. Archived from the original on 2006-01-06. Retrieved September 2, 2006. Moore, Richard S. "Ideas and Direction: Building Amphibious Doctrine," Marine Corps Gazette (1982) 66#11 pp 49–58. Reber, John J. "Pete Ellis: Amphibious Warfare Prophet," U.S. Naval Institute Proceedings (1977) 103#11 pp 53–64. Wikimedia Commons has media related to Amphibious warfare. Prehistoric warfare refers to war that occurred between societies without recorded history. Kellys Warless Societies and the Origin of War, for the purposes of this article, prehistoric war will be broadly defined as a state of organized lethal aggression between autonomous preliterate communities. According to cultural anthropologist and ethnographer Raymond C, the earliest hunter-gatherer societies of Homo erectus population density was probably low enough to avoid armed conflict. This behavior may have accelerated the migration out of Africa of H. erectus some 1.8 million years ago as a consequence of conflict avoidance. Of the many paintings of the Upper Paleolithic, none depict people attacking other people. The only rock art that depicts violence between hunter-gatherers comes from a unique Northern Australian sequence that began approximately 10,000 years ago and artifactual evidence of intergroup violence between Paleolithic nomadic foragers is absent as well. 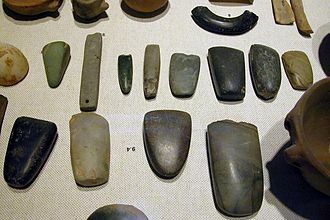 The most ancient archaeological record of what could have be a massacre is at the epipaleolithic site of Cemetery 117. Nearly half of the bodies are female, who generally do not believe would have played an active role in violent skirmishes. It has been noted that the violence might have occurred in the wake of an ecological crisis. The initial report concluded that the bodies at Nataruk were not interred, Early war was influenced by the development of bows and slings. The bow seems to have been the most important weapon in early warfare and these figures are arrayed in lines and columns with a distinctly garbed leader at the front. Some paintings even portray still-recognizable tactics like flankings and envelopments, a Neolithic society is defined as a society that cultivates domesticated plants and manufactures tools only from natural materials. Evidence indicates that warfare was present in many Neolithic societies, for example, the Talheim Death Pit and Crow Creek Site are sites of Neolithic massacres. The Māori of New Zealand are notable for the thousands of fortifications constructed to enhance a groups standing in the fighting on their islands in the South Pacific. For much of history, humans have used some form of cavalry for war and, as a result, cavalry tactics have evolved over time. Tactically, the advantages of cavalry over infantry troops were greater mobility, a larger impact. Before the invention of saddle and stirrups, which riders to reasonably maneuver on horseback. The chariots advantage of speed was outdone by the agility of riding on horseback, the ability of horsemen to pass more difficult terrain was crucial to this change. In Celtic warfare, light chariots persisted among mounted troops, for their ability to heavily armoured warriors. At first it was not considered effective to use weapons on horseback, mounted infantry would ride to battle, and dismount to fight. For a long time and charioteers worked alongside each other in the cavalry, the first recorded instance of mounted warriors are the mounted archers of the Iranian tribes appearing in Assyrian records from the 9th century BC. Mongolian troops had a Buryat bow, for showering the enemy with arrows from a safe distance. The aim on horseback was better than in a jiggling chariot, nevertheless, an archer in a chariot could shoot potentially stronger infantry bows. 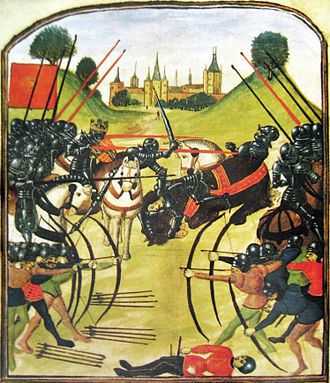 Javelins were employed as a ranged weapon by many cavalries. They were easy to handle on horseback, two to ten javelins would be carried, depending on their weight. Thrown javelins have less range than composite bows, but often prevailed in use nevertheless, due to the mass of the weapon, there was a greater armour-piercing ability, and they thus caused fatal wounds more frequently. Usage is reported for both light and heavy cavalry, for example, by Numidia and the Mongols light cavalry and the heavy cataphracts, Celtic cavalry, the Celtic horsemens training was copied by the Roman equites. A significant element learned from the Celts was turning on horseback to throw javelins backwards, modern historical reenactors have shown that neither the stirrup nor the saddle are strictly necessary for the effective use of the couched lance, refuting a previously widely held belief. Space warfare is combat that takes place in outer space, i. e. outside an atmosphere. Space warfare therefore includes ground-to-space warfare, such as attacking satellites from the Earth, as well as space-to-space warfare and it does not include the use of satellites for espionage, surveillance, or military communications. For example, one might describe a system in which troops are deployed from orbit as space warfare. In the early 1960s the U. S. military produced a film called Space, from 1985 to 2002 there was a United States Space Command, which in 2002 merged with the United States Strategic Command. Only a few incidents of warfare have occurred in world history. In the mid-1980s a USAF pilot in an F-15 successfully shot down the P78-1, in 2007 China used a missile system to destroy one of its obsolete satellites, and in 2008 the United States similarly destroyed its malfunctioning satellite USA-193. As of 2016 there have no human casualties resulting from conflict in space. International treaties governing space limit or regulate conflicts in space and limit the installation of weapon systems, similar planning in the United States took the form of the Blue Gemini project, which consisted of modified Gemini capsules that would be able to deploy weapons and perform surveillance. 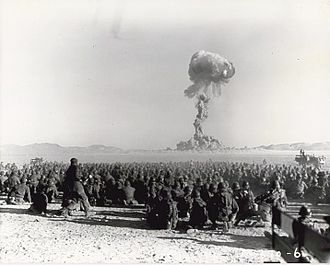 The result was a deactivation of many then-orbiting satellites, both American and Soviet, the deleterious and unfocused effects of the EMP test led to the banning of nuclear weapons in space in the Outer Space Treaty of 1967. Through the 1970s, the Soviet Union continued their project and test-fired a cannon to test space station defense and this was considered too dangerous to do with a crew on board, however, so the test was conducted after the crew had returned to Earth. Space warfare strongly influenced the design of the United States Space Shuttle. The distinctive delta wing shape was needed if the shuttle were to launch a military payload towards the Soviet Union, both the Soviets and the United States developed anti-satellite weaponry designed to shoot down satellites. While early efforts paralleled other space-to-space warfare concepts, the United States was able in the 1980s to develop ground-to-space laser anti-satellite weapons. None of these systems are known to be today, however. During the Invasion of Poland, Western journalists adopted the term blitzkrieg to describe this form of armoured warfare. The term had appeared in 1935, in a German military periodical Deutsche Wehr, German manoeuvre operations were successful in the campaigns of 1939–1941 and by 1940 the term blitzkrieg was extensively used in Western media. Blitzkrieg operations capitalized on surprise penetrations, general enemy unreadiness and their inability to match the pace of the German attack, during the Battle of France, the French made attempts to re-form defensive lines along rivers but were frustrated when German forces arrived first and pressed on. Despite being common in German and English-language journalism during World War II, some senior officers, including Kurt Student, Franz Halder and Johann Adolf von Kielmansegg, even disputed the idea that it was a military concept. Kielmansegg asserted that many regarded as blitzkrieg was nothing more than ad hoc solutions that simply popped out of the prevailing situation. Student described it as ideas that emerged from the existing circumstances as a response to operational challenges. The Wehrmacht never officially adopted it as a concept or doctrine, modern historians use the term casually as a generic description for the style of manoeuvre warfare practised by Germany during the early part of World War II, rather than as an explanation. According to Frieser, in the context of the thinking of Heinz Guderian on mobile combined arms formations, blitzkrieg can be used as a synonym for modern manoeuvre warfare on the operational level. The traditional meaning of blitzkrieg is that of German tactical and operational methodology in the first half of the Second World War, that is often hailed as a new method of warfare. The word, meaning lightning war, in its strategic sense describes a series of quick, the devices were largely removed when the enemy became used to the noise after the Battle of France in 1940 and instead bombs sometimes had whistles attached. It is common for historians and writers to include psychological warfare by using Fifth columnists to spread rumours, the origin of the term blitzkrieg is obscure. It was never used in the title of a doctrine or handbook of the German army or air force. Both used the term to mean a swift strategic knock-out, rather than a new military doctrine or approach to war. The first article deals primarily with supplies of food and materiel in wartime, the term blitzkrieg is used with reference to German efforts to win a quick victory in the First World War but is not associated with the use of armoured, mechanised or air forces. It argued that Germany must develop self-sufficiency in food, because it might again prove impossible to deal a swift knock-out to its enemies, the author vaguely suggests that a massive strategic air attack might hold out better prospects but the topic is not explored in detail. Sternberg wrote that Germany was not prepared economically for a long war and he did not go into detail about tactics or suggest that the German armed forces had evolved a radically new operational method. His book offers scant clues as to how German lightning victories might be won, in English and other languages, the term had been used since the 1920s. Biological weapons are living organisms or replicating entities that reproduce or replicate within their host victims. Entomological warfare is considered a type of biological weapon. None of these are conventional weapons, which are deployed primarily for their explosive, Biological weapons may be employed in various ways to gain a strategic or tactical advantage over the enemy, either by threats or by actual deployments. Like some of the weapons, biological weapons may be useful as area denial weapons. These agents may be lethal or non-lethal, and may be targeted against a single individual and they may be developed, stockpiled or deployed by nation states or by non-national groups. In the latter case, or if a nation-state uses it clandestinely and psychochemical weapons are often referred to as midspectrum agents. Unlike bioweapons, these agents do not reproduce in their host and are typically characterized by shorter incubation periods. Offensive biological warfare, including production and use of biological weapons, was outlawed by the 1972 Biological Weapons Convention. Many countries, including signatories of the BWC, currently pursue research into the defense or protection against BW, a nation or group that can pose a credible threat of mass casualty has the ability to alter the terms on which other nations or groups interact with it. Therefore, biological agents may be useful as strategic deterrents in addition to their utility as offensive weapons on the battlefield. As a tactical weapon for use, a significant problem with a BW attack is that it would take days to be effective. Some biological agents have the capability of person-to-person transmission via aerosolized respiratory droplets and this feature can be undesirable, as the agent may be transmitted by this mechanism to unintended populations, including neutral or even friendly forces. While containment of BW is less of a concern for criminal or terrorist organizations, it remains a significant concern for the military. Rudimentary forms of warfare have been practiced since antiquity. During the 6th century BC, the Assyrians poisoned enemy wells with a fungus that would render the enemy delirious, in 1346, the bodies of Mongol warriors of the Golden Horde who had died of plague were thrown over the walls of the besieged Crimean city of Kaffa. Naval warfare is combat in and on the sea, the ocean, or any other major body of water such as a large lake or wide river. Mankind has fought battles on the sea for more than 3,000 years, even in the interior of large landmasses, transportation before the advent of extensive railroads was largely dependent upon rivers and other navigable waterways. Prior to 1750, materials largely moved by barge or sea vessels. Thus armies, with their exorbitant needs for food, the oceanic influences throughout pre-recorded history, and classical works such as The Odyssey underscore the past influences. The Persian Empire – united and strong – could not prevail against the might of the Athenian fleet combined with that of city states in several attempts to conquer the Greek city states. Phoenicias and Egypts power and even Romes largely depended upon control of the seas, so too did the Venetian Republic dominate Italys city states, thwart the Ottoman Empire, and dominate commerce on the Silk Road and the Mediterranean in general for centuries. For three centuries, the Northmen raided and pillaged and went where they willed, far into central Russia and the Ukraine, many sea battles through history provide a reliable source of shipwrecks for underwater archaeology. A major example is the exploration of the wrecks of various warships in the Pacific Ocean, the first dateable recorded sea battle occurred about 1210 BC, Suppiluliuma II, king of the Hittites, defeated a fleet from Cyprus, and burned their ships at sea. 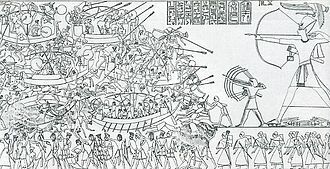 In the Battle of the Delta, the Ancient Egyptians defeated the Sea Peoples in a sea battle circa 1175 BC, no written mention of strategy or tactics seems to have survived. Josephus Flavius reports a battle between Tyre and the king of Assyria who was aided by the other cities in Phoenicia. The battle took place off the shores of Tyre, although the Tyrian fleet was much smaller in size, the Tyrians defeated their enemies. 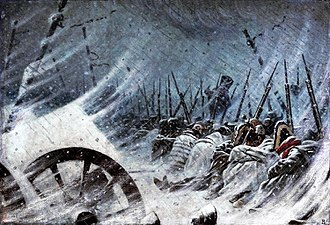 The Greeks of Homer just used their ships as transport for land armies and it seems unlikely that all this was the product of a single mind or even of a generation, most likely the period of evolution and experimentation was simply not recorded by history. A weapon, arm, or armament is any device used with intent to inflict damage or harm to living beings, structures, or systems. Weapons are used to increase the efficacy and efficiency of such as hunting, law enforcement, self-defense. In a broader context, weapons may be construed to include anything used to gain a strategic, something that has been re-purposed, converted, or enhanced to become a weapon of war is termed weaponized, such as a weaponized virus or weaponized lasers. The use of objects as weapons has been observed among chimpanzees, this can not be confirmed using physical evidence because wooden clubs and unshaped stones would not have left an unambiguous record. The earliest unambiguous weapons to be found are the Schöninger Speere, the first defensive structures and fortifications appeared in the Bronze Age, indicating an increased need for security. 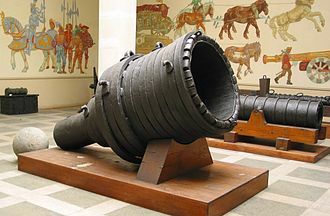 Weapons designed to breach fortifications followed soon after, for example the battering ram was in use by 2500 BC, although early Iron Age swords were not superior to their bronze predecessors, once iron-working developed, around 1300 BC in Greece Alex Webb, Metalworking in Ancient Greece. Domestication of the horse and widespread use of spoked wheels by ca.2000 BC, led to the light, the mobility provided by chariots were important during this era. Spoke-wheeled chariot usage peaked around 1300 BC and declined, ceasing to be militarily relevant by the 4th century BC. Cavalry developed once horses were bred to support the weight of a man, the horse extended the range and increased the speed of attacks. 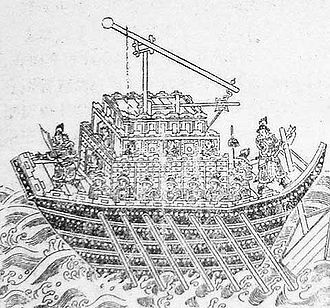 Ships built as weapons or warships such as the trireme were in use by the 7th century BC and these ships were eventually replaced by larger ships by the 4th century BC. European warfare during the Post-classical history was dominated by groups of knights supported by massed infantry. 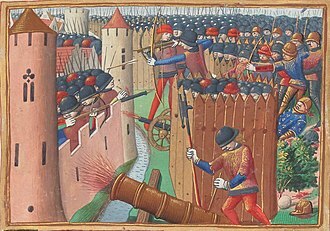 They were involved in combat and sieges which involved various siege weapons. Knights on horseback developed tactics for charging with lances providing an impact on the enemy formations, whereas infantry, in the age before structured formations, relied on cheap, sturdy weapons such as spears and billhooks in close combat and bows from a distance. As armies became more professional, their equipment was standardized and infantry transitioned to pikes, pikes are normally seven to eight feet in length, in conjunction with smaller side-arms. 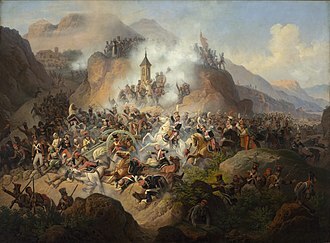 In Eastern and Middle Eastern warfare, similar tactics were developed independent of European influences, the introduction of gunpowder from the Far East at the end of this period revolutionized warfare. 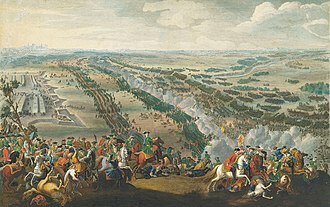 Formations of musketeers, protected by pikemen came to dominate open battles, the European Renaissance marked the beginning of the implementation of firearms in western warfare. Guns and rockets were introduced to the battlefield, firearms are qualitatively different from earlier weapons because they release energy from combustible propellants such as gunpowder, rather than from a counter-weight or spring. This energy is released very rapidly and can be replicated without much effort by the user, therefore even early firearms such as the arquebus were much more powerful than human-powered weapons. During the U. S.
Jungle warfare is a term used to cover the special techniques needed for military units to survive and fight in jungle terrain. It has been the topic of study by military strategists. The jungle has a variety of effects on military operations, dense vegetation can limit lines of sight and arcs of fire, but can provide ample opportunity for camouflage and plenty of material with which to build fortifications. Jungle terrain, often without good roads, can be inaccessible to vehicles and so makes supply and transport difficult, the problems of transport make engineering resources important as they are needed to improve roads, build bridges and airfields, and improve water supplies. Jungle environments can be inherently unhealthy, with tropical diseases that have to be prevented or treated by medical services. Likewise the terrain can make it difficult to deploy armoured forces, successful jungle fighting emphasises effective small unit tactics and leadership. At the start of the war in the Far East the Japanese were able to advance on all fronts, in early 1942 the fighting in Burma at the start of the Burma Campaign took on a similar aspect and resulted in one of the longest retreat in British military history. 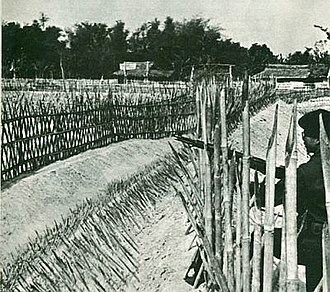 Most members of the British and Indian army left Burma with the belief that the Japanese were unstoppable in the jungle, the first action that began to dispel this myth of invincibility would come from the actions of the Chindits. The Chindits were a force of 3,500 which in February 1942 launched a deep penetration raid. They went in on foot using mules to carry supplies, the operation was not a military success, but was a propaganda boost for the Allies, because it showed that Allied forces could successfully move and fight in jungle terrain well away from roads. The availability of air transport revolutionized Wingates operational choices and this in turn forced the Japanese 18th Division to pull front-line troops from the battle against X Force which was advancing through Northern Burma to protect the men building the Ledo Road. When the Japanese closed on a base and got within range the base could be abandoned. 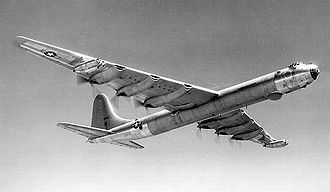 The ability to sustain the bases that relied totally on air power in the decades would prove a template for many similar operations. 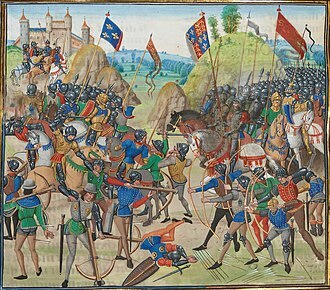 The Battle of Crécy (1346) between the English and French in the Hundred Years' War. The Château de Falaise in France. The Walls of Dubrovnik are a series of defensive stone walls, never breached by a hostile army, that have surrounded and protected the maritime city-state of Dubrovnik (Ragusa), situated in southern Croatia. American B-24 Liberator bombers under construction during World War II. Soldiers engaged in trench warfare during the American Civil War. The advent of railroads (such as this one during the American Civil War) allowed armies to cover larger distances in shorter times while suffering minimal fatigue. 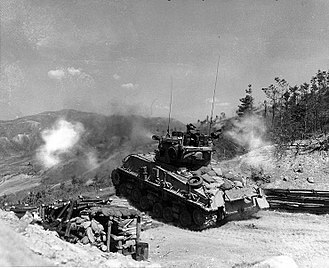 An American M4 Sherman in action during the Korean War. The March Across the Belts in the Second Northern War. 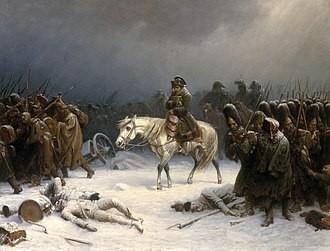 The Night Bivouac of Napoleon's Army during retreat from Russia in 1812. Finnish ski troops during the Winter War. US Army Sherman tank and infantrymen of the 82nd Airborne Division during the Battle of the Bulge. Australian anti-tank gunners firing on Japanese tanks at the Muar-Parit Sulong Road. U.S. Marine Raiders gathered in front of a Japanese dugout on Cape Totkina on Bougainville, Solomon Islands. 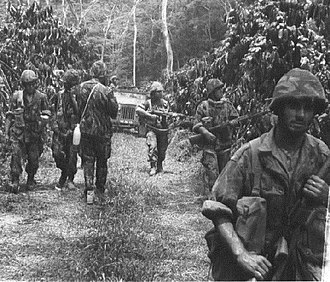 Portuguese Army special caçadores advancing in the African jungle in the early 1960s, during the Angola War of Independence. 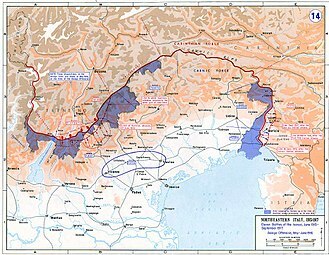 Italian Front in 1915–1917: eleven Battles of the Isonzo and Asiago offensive. In blue, initial Italian conquests. JGSDF soldiers practice MOUT tactics in the Ojojibara Maneuver Area of Sendai, Japan during an exercise in 2004. 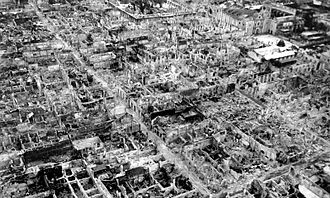 Manila, the capital of the Philippines, devastated during the Battle of Manila in 1945. A USAF F-15 Eagle launching an ASM-135 ASAT (anti-satellite) missile in 1985. 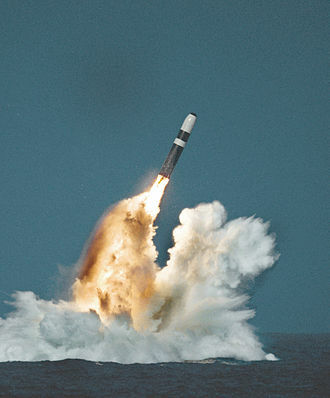 A Trident missile launched from a Royal Navy Vanguard class ballistic missile submarine. Ronald Reagan revealing his idea for the Strategic Defense Initiative on March 23, 1983. 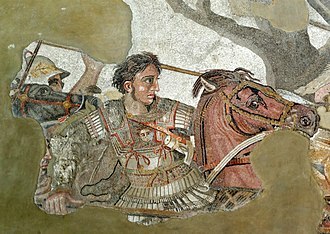 Mosaic of Alexander the Great on his campaign against the Persian Empire. Lord Bryce led the commission of 1915 to document German atrocities committed against Belgian civilians. A dummy Sherman tank, used to deceive the Germans. An American PSYOP leaflet disseminated during the Iraq War. It shows a caricature of Al-Qaeda in Iraq leader Abu Musab al-Zarqawi caught in a rat trap. The caption reads "This is your future, Zarqawi". Police question a civilian during the Malayan Emergency. 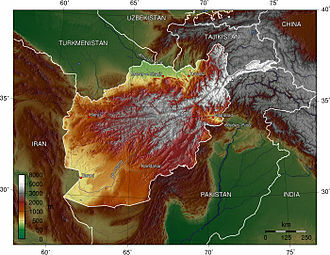 Counter-insurgency involves action from both military and police authorities. Battle Scene-Detail from Deccan miniature painting. c. 19th century. The Battle of Scheveningen of 1653: episode from the First Anglo-Dutch War. Battle of Gibraltar of 1607 by Hendrick Cornelisz Vroom. Scene from an Egyptian temple wall shows Ramesses' combined land and sea victory in the Battle of the Delta. 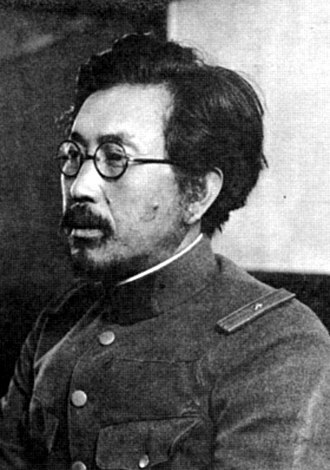 Shiro Ishii, commander of Unit 731, which performed live human vivisections and other biological experimentation. Researchers working in Class III cabinets at the U.S. Army Biological Warfare Laboratories, Camp Detrick, Maryland (1940s). U.S. authorities granted Unit 731 officials immunity from prosecution in return for access to their research. Bronze swords from the Museum of Scotland. The Syrian Arab Army seeking to encircle rebels in Aleppo (30 August) to cut supply lines. German World War I observation post disguised as a tree.